I feel like I’ve lost my crafting mojo lately. Maybe it has something to do with it being the dog days of summer, but I feel a little bit in a crafting funk. Now, I still dabble. I half-heartedly put in a good 9 inches of hand-sewn binding on a charity quilt at the pool they other day. And I’ve been plugging away at knitting some of the world’s easiest dishchoths here and there. But I haven’t felt engaged and excited about a project lately. I miss that. It may be, in part, because I am spending a lot of time in the kitchen these days. I always cook, and mostly from scratch, but the 30 Day Vegan workshop really pushes it up to another level for me. Beans, grains, sauces, dressings, snacks- and these things just to stock the fridge so that I can put something together come dinnertime! I’m still trying to find that balance of eating and cooking this way while giving my kids something they don’t dread for dinner. I love to spend time in the kitchen, but there are only so many hours in the day, and it is definitely cutting into my sewing time. So, if I had all the time in the world, what would I be working on? ~ a pillow based on Anna Maria Horner’s wholeclolth quilting project. I bought some Valori Wells Wrenly fabric (Ingrid) at the Sister’s Outdoor Quilt Show with this in mind, but it has not even made it out of the bag yet. I think it will lend itself very well to this project. 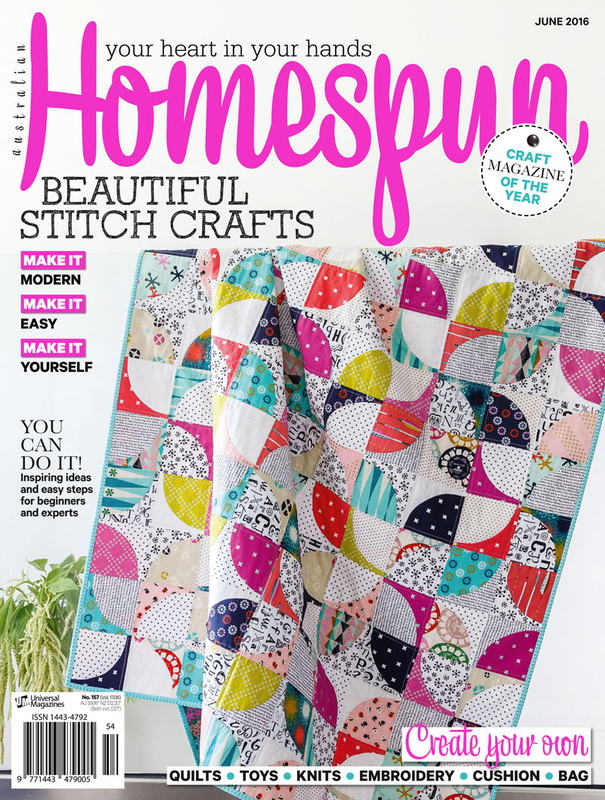 I love handwork, so I am looking forward to this. ~ a Wrenly quilt. I bought fabric at Sister’s for a Wrenly quilt, and I bought a pattern too, but I think I want to design my own quilt instead. So, ideas are percolating in the back of my mind for this one. ~ baby quilts. I am toying with the idea of opening an Etsy shop with baby quilts, other baby items, table runners, and other handmade items for the home. So once again, percolating. I think I am finding a theme here. 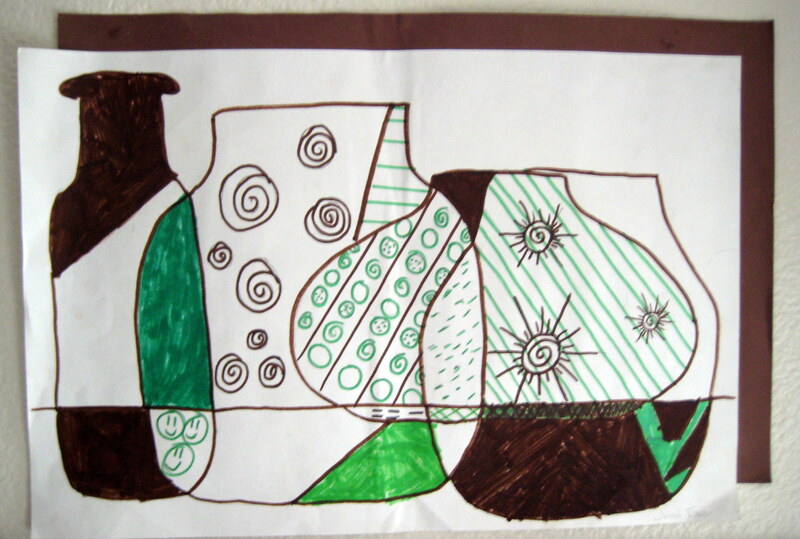 This is a school art project done by Boy 1. I love it. I love how the jars intersect and overlap. I don’t think I really have the right fabric for this, so I’ve been percolating on that one too. ~ play blocks. 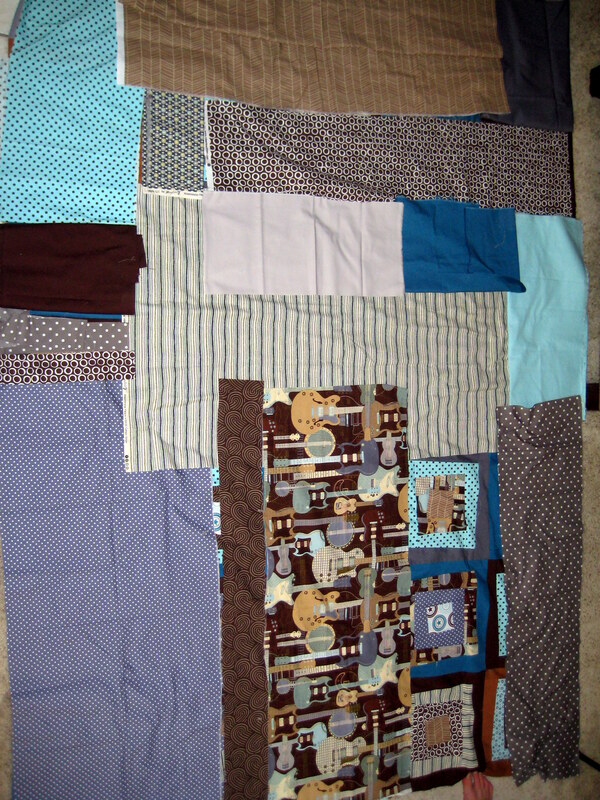 I spent one evening with the book Liberated Quiltmaking from the library and just made improv blocks and house blocks. 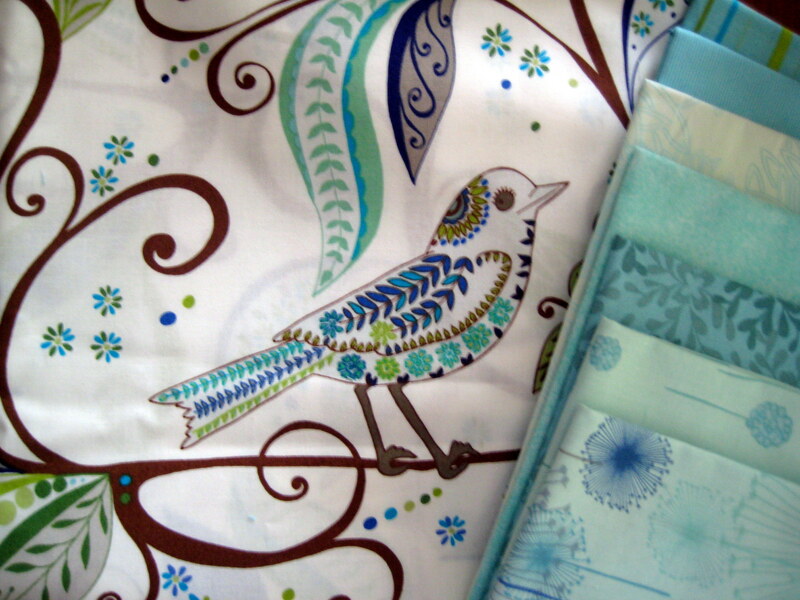 I would love to spend some time just playing with solid fabrics- making little one-block works of art. Maybe it would become a quilt, maybe not. I just want to play. 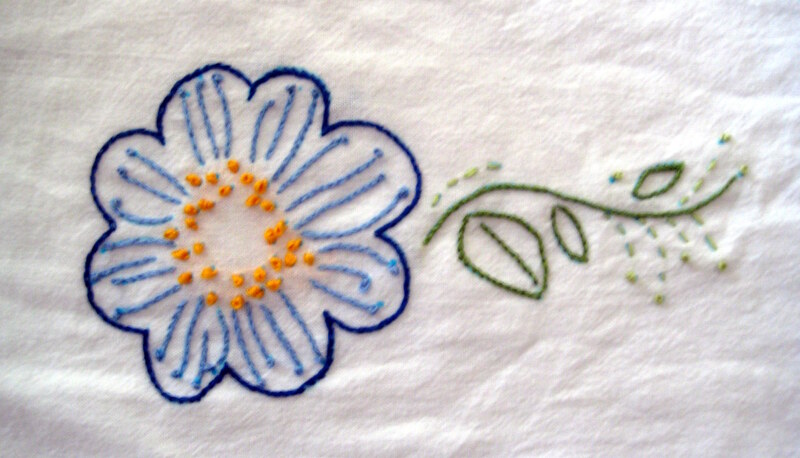 ~ embroider tea towels. Also inspired by Anna Maria Horner, I’ve been embroidering a little lately. I love to have these flowersack tea towels around, not to dry dishes, for which I feel they are worthless, but to use like paper towels, drying veggies, or to put over a bowl of rising bread dough. My local quilt shop is doing a class on embroidering tea towels and handkerchiefs, making the back look as good as the front. I’d like to take it, since there is no way I’m taking a picture of the back of this tea towel. So there is my all the time in the world list. I’d better get crackin’. Thank you so much for that link! I love those quilts. My son plays guitar- so I especially love that one. I will pop over to your site to try and find your vase quilt. Also- I added you to my sidebar- don’t know how I missed you first time around!